This supports your markilux and is particularly stable. 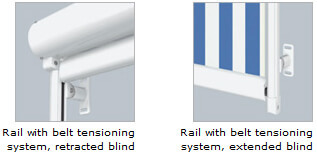 The end-to-end profile ensures a light and individual mounting to a wall or the window frame. The pre-assembled and patented clip-on mountings result in a very fast mounting process. 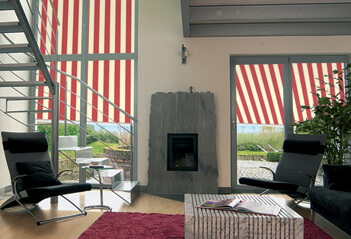 All markilux blind covers can be used. The markilux transolair is particularly well suited to this application because it provides a very comfortable level of shade, whilst leaving an unspoilt view. 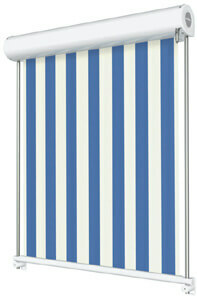 The cover is available in lengths of up to 400 cm. The standard blind is operated manually fitted with a universal joint and winding handle with bayonet fitting. An electric motor (tubular motor with electronic limit switching) is available as an optional extra. The tensioning with elastic variable belt system results in a very tight blind.